I am not a food stylist. I cannot make food look pretty when it doesn't want to. That's what the Kewpies are for. Today's lamingtons were originally going to be made with chocolate cake and coated in a rich chocolate chestnut ganache. You cannot deny that they sound wonderful, but they were not to be. Last time I opened a can of chestnut purée to make some brownies (that never got blogged! ), I ate almost the entire tin and I just cannot face that sort of greed-induced nausea again. I'm sorry. Don't make me do it. So, inspired by Ms. Humble's Lemon Meringue Lamington (the most amazing thing I have ever seen) from last year, I decided to get creative with the egg whites. I have never made Baked Alaska before, or even eaten it, but it intrigues me. Ice-cream getting baked and not melting is quite an exciting idea. Except when I do it, the ice-cream melts and I can't make it look pretty like the lamington it was inspired by. Gah. The good news is that even ugly Baked Alaska Lamingtons taste delicious! Happy Australia Day everybody! Thanks for playing along with me again this year, and also for all the entries you've sent my way. We already have more than last year, and I've been told even more are headed this way since the deadline was extended. See you back here for the round up! First, make the cake sandwiches. Slice the cake in half and spread with jam. Then fill with ice-cream. I used a block, so it was easy to slice. 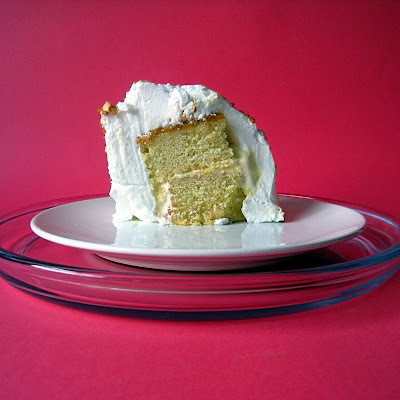 Store in the freezer while you make the meringue, and heat the oven to 190°C. (For the meringue coating, know that this amount generously covers two small lamingtons. Scale up accordingly.) Beat the egg whites until frothy, then add the sugar and continue beating until stiff peaks form. Cut the now chilled cake sandwich into as many lamingtons as you require. Place them on a lined baking sheet and cover with the glossy meringue. Smooth with a spatula and sprinkle with coconut. Bake for 5 - 10 minutes or until browned. Serve immediately. OMG, MR P - I am devastated...not because I can't have a bite of your latest reinvention but because I thought the deadline was the 28th...not the 26th! I was going to create my "lava flow lamington" tomorrow night...dang it. I'm so sorry. I will make it anyways and let you know how it turns out! you are all sorts of inventive and awesome! Mmm baked alaska. That is all. Ok, just read through your posts and see that the deadline has been extended...insert "jump for joy" here!! So just ignore my previous ranting! Love this one Mr P. - looks like a mountain of sweet deliciousness! I don't think these look ugly - I want to dig my spoon right in! And yet another creative take on the lamiongton. Well done - you have the title of honorary Australian, Mr P.
Yum, anything that combines cake and ice cream has got to be good. I am also really glad you extended the deadline :) as I have an entry too. My post for Mt. Lamington and how Super K saves the day is up. That looks so good!!! Amazing! I know this doesn't have anything to do with your lamingtons but I had to stop by and THANK you for your recipes..
My family, boyfriend and friends love you after I tried your Almond and Macadamia nuts cookies this weekend..!! oh no I missed the boat to submit my creation of lamingtons!.Was too busy and behind my baking schedule. I want both of the prizes! 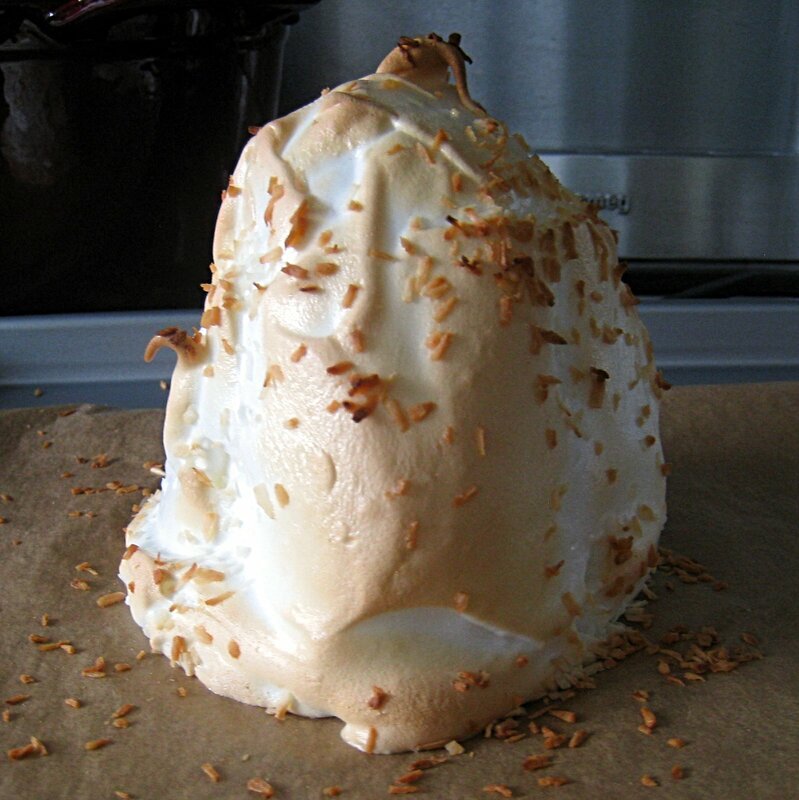 Should you be interested in baked alaska, google Heston Blumenthal's. Now that's the ultimate Baked Alaska. G'day from Australia :) Love your blog, its fantastic. Baked Alaska Lamingtons....., that's awesome & they would so taste a treat too. Looking forward to checking back in with you again.